E-Design is an affordable way to design your space with expert advice- all while working in your budget and at your own pace. We'll correspond via e-mail to create your perfect room design. Pricing is dependent on size and needs of the space. We'll start with you sending photos of your space and any inspiration photos you may have. Next we'll chat via e-mail about your goals for the room and schedule you into the E-Design queue. - One Set of Revisions- After you receive your initial design board you can take your time with any comments or critiques you have and your board will be revised to reflect these changes. Maybe you already have a great start to your room and are looking for those few extra pieces such as drapes, pillows or artwork to finish it off. 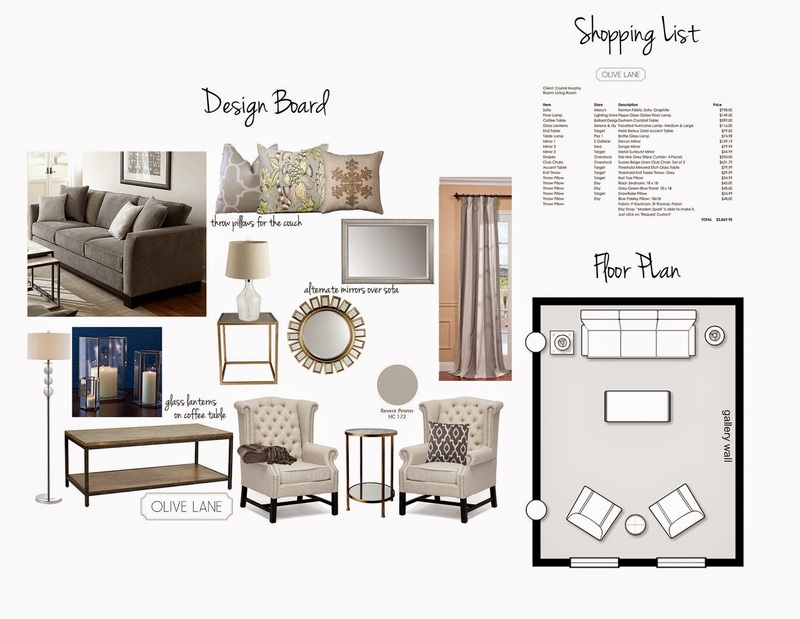 With this package you'll receive a small design board with a shopping list to finish your space. Not seeing what you're looking for? That's the great part about Olive Lane- I can customize any package to suit your needs, just ask!